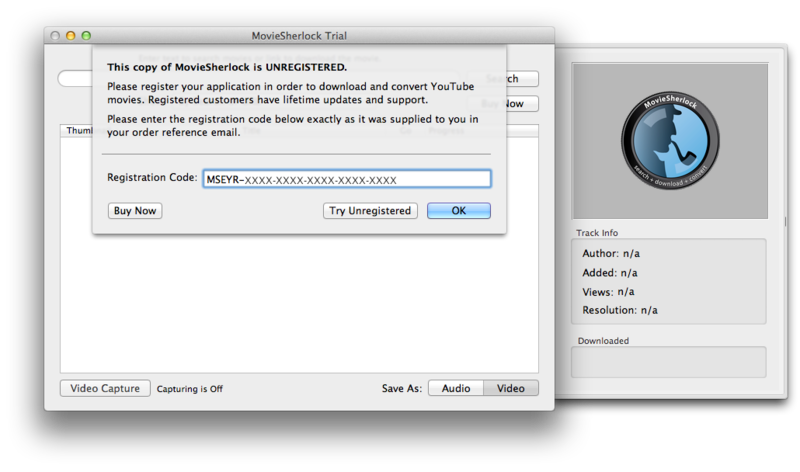 MovieSherlock license code. How to register Moviesherlock - YouTube / Vimeo / DailyMotion downloader & to mp3 converter. License MovieSherlock serial. Find your license code in your purchase order email. Please make sure your Internet connection is up and running. Copy/paste the license code (with dashes avoiding spaces) from your order to Activation dialog. Click OK.
That's it! In just a few seconds MovieSherlock will confirm your license code and MovieSherlock window title will state name of edition you own. Congratulations! You now own the best available Mac YouTube / Vimeo / etc downloader and mp4/mp3 converter! We hope, you will love MovieSherlock as much as we do!